This University of Wisconsin logo scrapper mat is the perfect outdoor mat for the discerning Badgers fan. This outdoor doormat is an extremely tough and durable welcome mat that is made out of a heavy duty rubber. These mats are manufactured with raised "scrapper nibs" that act as an aggressive scrapping surface for your guests shoes while also creating deep reservoirs to help contain water and other debris. Along with rugged ribs for an aggressive scraping surface the rubber backing is smooth and so will be skid resistant on most surfaces Care of the mat itself is also very easy as all you need to do is hose it off, brush it lightly and then let it air dry. 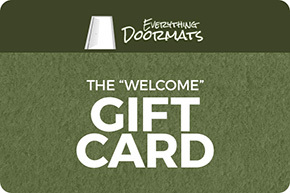 Rubber doormats make excellent welcome mats for your home. Image is printed using true team colors licensed by University of Wisconsin. Made right here in the USA! Support Local Manufacturing. This University of Wisconsin doormat is made from durable non-skid rubber making it the perfect product any household. This Wisconsin Badgers outdoor doormat comes in an 19" x 30" size.